Nick, the other fifth grade teacher in my school, came to me the other day. He got his SMARTboard this year, but-unlike me-has never used one before. 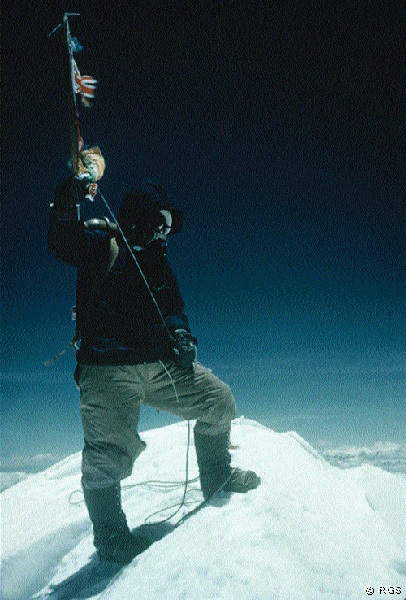 Nick had been teaching the kids about the Himalayas, and how the climbers have to prepare to scale the enormous peaks. Before having a whiteboard, he would have to just describe those mountains to kids who may have never seen anything like them before. Now, within a few moments, he found an online slideshow that showed the kids all of the equipment climbers use and how they prepare. He also shared a two-minute video of a person on the top of Mount Everest, looking up at a sky that’s almost black because the air is so thin, and looking down on clouds thousands of feet below. A whole new perspective on the world, via interactive whiteboard. Meanwhile, next door, the sixth grade teacher, Scott, was showing his kids a movie of the Hindenburg crashing to the ground-demonstrating how dangerous gases (specifically hydrogen) can be. The SMARTboard is more than just a computer screen I can write on. For the students it’s a window to the world, something that as a teacher I can use to show them what’s out there. For a small school like mine, having the ability to connect my students instantly with curriculum like this completely changes how I teach. We like to talk about how we use interactive whiteboards now, and how we could spend weeks learning all the ways to apply them and still only be scratching the surface. How long will it be before they are standards in the classroom? I don’t know if it will ever happen, but it would be great if it were true. I work in a school that was cutting-edge when it opened. 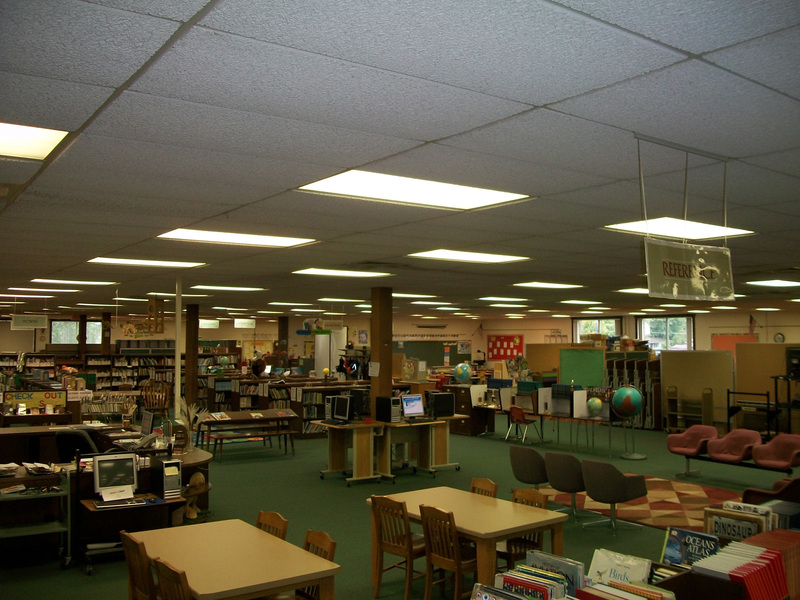 Greenwood Elementary, dedicated in 1970, was constructed using an “open concept” in school design—very 70’s. The idea was to create a school without walls, divided only by office dividers and shelves. 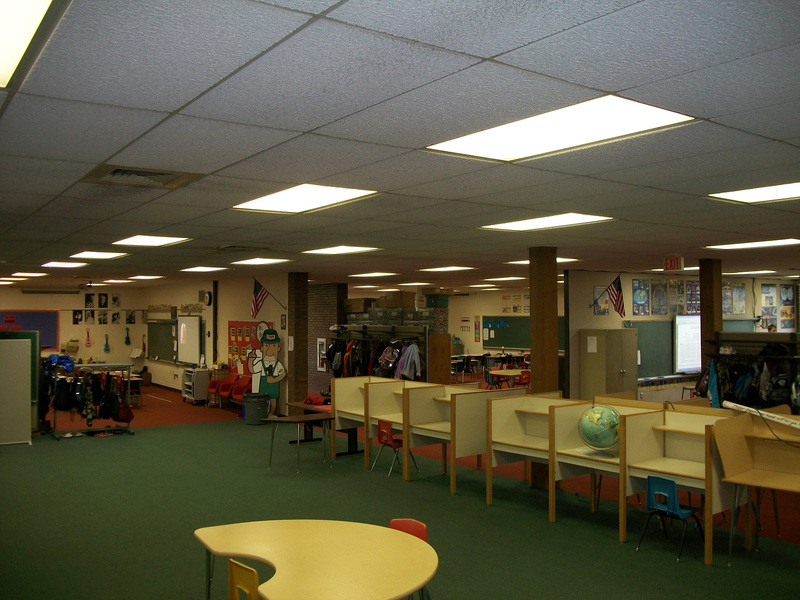 Greenwood Elementary is divided into two halves—a group-use half and a classroom half. The group-use half contains the only doors inside the school. It features the music room, the office, the art room, the gym/cafeteria and the kindergarten rooms. The classroom half is arranged in a large semicircle, with a library in the middle resembling a courtyard, and grades 1-5, surrounding it, divided by a combination of shelves, partitions and cabinets. Working in this kind of school building has pros and cons. For example, I cannot close the door when watching a movie that would disturb my neighbors. However, I can put a group into the courtyard/library to work knowing that if they are up to something I can just peer over the divider and see them. In many ways, what we lack in privacy we gain in community. A teacher who needs help simply asks the neighbor over the divider. Sending a kid to the lab or to the next class is never intrusive. During a rainy spell in summer school, we removed some of the dividers and played T-ball inside. Greenwood is a place where kids learn about the outside world and get a chance to compete. For some it’s a chance to take in a football or basketball game or to participate in one. For others, it’s a chance to socialize and have fun, to go skiing or rollerblading during gym class, or go fishing during the after-school program. For many small towns, the school is seen as something that defines them as a community and Greenwood seems no different. Editor’s Note: Lee Briggs will be blogging for Weekly Reader in the 2010-11 school year. Take it away, Mr. Briggs! I grew up with computers in education – and in a way, they’ve grown up with me. My father was a high school math teacher who was interested in computers in the early 1980s. He eventually became the district’s technology coordinator. Even as a child, I saw what works with instructional technology (The Apple IIe) and what does not (Laserdisk). I also got really good at Oregon Trail. I attended the University of Wisconsin-Oshkosh for elementary education. I worked my way through school by maintaining a lab of Macintosh computers for the journalism department. I met my future wife there. I also got my first taste of how computers in education are managed and maintained from the technical point of view. I worked for a small district outside of Madison where I had the chance to be part of an HP grant to incorporate technology into schools. It was then that I began my love affair with interactive whiteboards and saw how dramatically a tool can affect instruction for the better. Working with the grant team gave me a chance to see how a community of educators, working together, can make a difference. Now I work in Greenwood, a small rural school district. I am a Math and Reading Teacher in the mornings and a technology teacher in the afternoon. I also help with gifted and talented classes and assist other teachers in their technical needs. I work with a fantastic group of teachers who embrace the new like no other group I have seen. Kids often come in to school talking about the upcoming hunting season and cleaning calf pens, only to then sit down at a computer and post their reading work on our online Moodle forum. 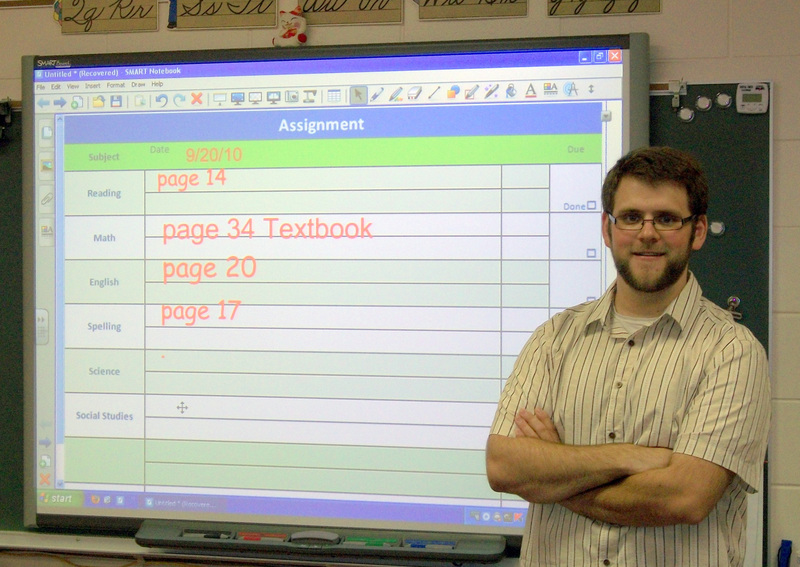 Me, with my SmartBoard. As a teacher, I need it more than coffee. Throughout my time in college and in my teaching career, I have explored which practical tools can improve student learning and what strategies work in a real classroom with real kids. I have been lucky to work for districts that are supportive of new ideas and teachers who adapt to changes in the classroom with enthusiasm and creativity. I am hoping that this blog will be a place to document some of the things I am doing here in my district as I work to incorporate technology into the classroom. I also hope that this blog can be a place that starts meaningful discussions about what is happening in classrooms everywhere, that we as teachers can share the things that work in education today. I look forward in the school year to come to hear about some of the other wonderful things that are happening in classrooms around the country in this, the most exciting time to be a teacher. 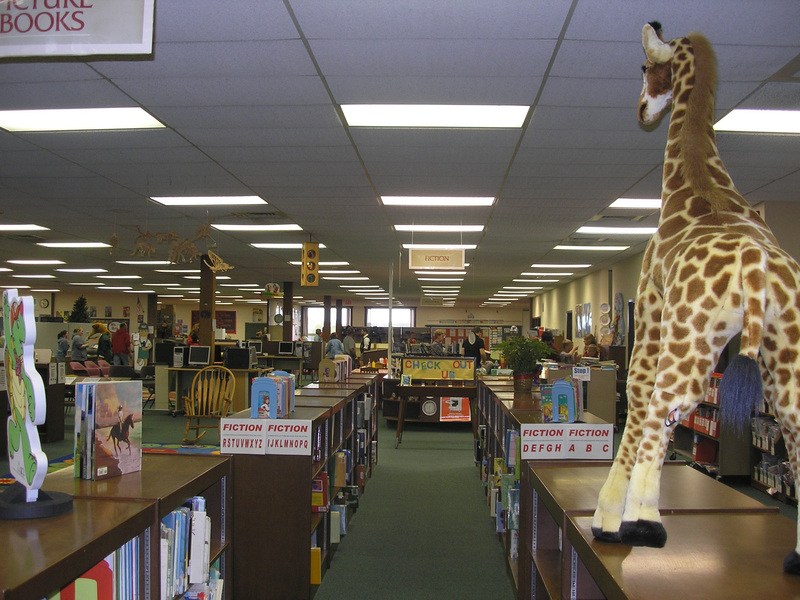 Welcome to Weekly Reader’s new blog: Tales From a 21st Century Teacher. Please visit the blog regularly for updates from Weekly Reader’s teacher-blogger, Lee Briggs, of Greenwood Elementary School in Wisconsin.